Michael McFadyen's Scuba Diving - Sinavi Reef The capital city of Papua New Guinea is Port Moresby, a lively city that sits on the waters of Port Moresby Harbour. The harbour is protected from the open sea by a barrier reef that extends right along the coastline of Port Moresby and the land to the west and east. South-west of the city is an island called Dango (Fishermen's) Island and outside this, a reef called Sinavi Reef. This reef makes up the western barrier to the harbour and is also the western side of the main entrance to the harbour, Basilisk Passage. To get to this site, you travel out the main passage past the port channel marker and towards other dive sites like Shark Inn. Sinavi Reef dive site is located just to the north of Shark Inn and is almost the eastern end of Sinavi Reef. The site consists of a reef that has a bump in it (the reef runs north-south) and off the reef there are a couple of bommies. From the anchor spot on the reef top, descend and swim to the east over the wall. The depth on the top is six metres and the wall drops to 30 metres. It is about 50 to 75 metres off the reef to the first bommie. This is about 30 by 30 metres at the top and about 10 metres deep on the top. The eastern side of the bommie is about 45 metres deep and drops in a steep slope to over 60 metres. Swim around the bommie and start an ascent from whatever depth you decide to reach. There are some nice gorgonias, sea whips and sponges on this wall. On the northern side of the bommie there is another bommie which is about 15 metres away. It is about 17 metres deep between the bommies. In the gap between the bommies I found a small anemone with three very small clownfish. One was about 20 mm, the next 10 mm and the last a very tiny 5 mm. Fantastic! Too bad they were so flighty, I could not get a decent photo, especially the smallest one. 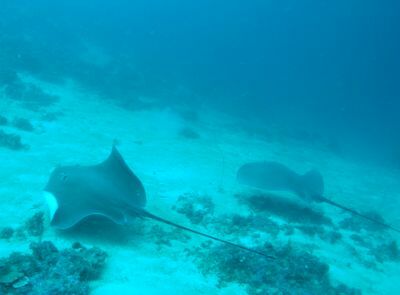 I saw two large rays on this dive (cannot actually remember where, but I think it was just off the main reef) and as I was taking photographs, another eagle ray came in from the same direction (the deep) and yet another, unknown to me, swam over my head. Continuing our way back up the bommie, we came to a ledge on the western side. This was at about 13 to 15 metres. There were some anemones and clownfish here. I also saw a number of very colourful sea cucumbers, one a bright red and white. 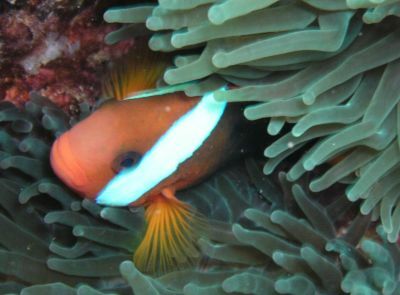 Once you have finished on the bommie, swim back to the main reef. A very good dive, water temperature 26.5°C and visibility of at least 30 metres.